The page and its content is highly confusing. First of all, “free trial” and “premium” are displayed as two different plans. But a free trial is not a plan: it’s a trial, that let’s you - try - the software, decide, and buy it. So a much better info architecture for the page would be to offer one plan, called whatever, and explain that this plan is available on a “free trial” basis. The second problem is that “free trial” and “request a demo” are two things that shouldn’t coexist. 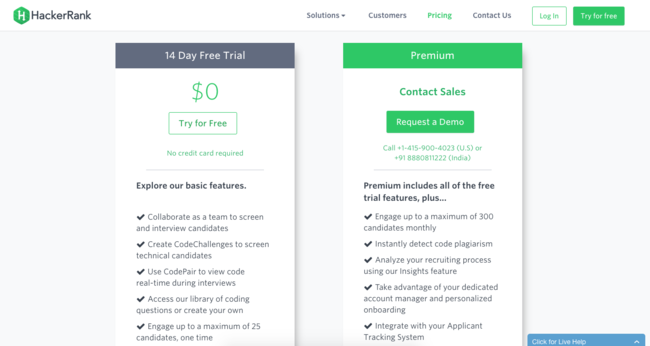 If the company offers a free trial, it’s moving along the lines of a self-service model, where the trial is the actual demo, allowing the potential buyer to decide if he wants to purchase the software. If it offers a trial, it should also offer pricing for customers that decide to buy it for good. “Request a demo” is not a logical next step after a trial. A logical next step could be “call us if you have any questions” but not get another demo. On the other hand, if the software is so expensive as to require an inbound salesperson, a sales engineer, and the sorts, it should not offer a free trial. It will only mess up with prospective customers’ heads, who’ll be lured into the software without knowing how ridiculously expensive it is. The conversion rates (from trial to paid) will look terrible, because many bad fit prospective customers are getting lured into the pipeline for the wrong reasons. Now, of course, I may be missing some important part of this company’s strategy. There may be some amazing Silicon Valley black magic that says this weird mix is good business. I’m not sure. As a potential customer, I felt dumbfounded and confused by these two not mutually exclusive confusing choices.